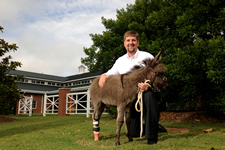 Auburn, Ala., July 25, 2012 – Auburn University’s College of Veterinary Medicine and Hanger Clinic, formerly Hanger Prosthetics and Orthotics, are working together on a case that could have implications in the treatment and rehabilitation of horses, donkeys and other equines with congenital deformities or injuries. Emma, a miniature donkey foal, was just two days old when she arrived at the John Thomas Vaughan Large Animal Teaching Hospital in April with a severe hind limb deformity, one that required amputation of the limb and the placement of a prosthesis. Hanger Clinic prosthetist Billy Fletcher and Emma. Dr. Fred Caldwell, an assistant professor in the Department of Clinical Sciences and equine surgeon, performed the procedure, and is working with clinician Billy Fletcher from Hanger Clinic – the same company which made the prosthetic tail for Winter, the amputee dolphin and star of the film “Dolphin Tale” – to develop a prosthesis for her limb. The two worked out a plan to both allow Emma time to heal from the surgery and transition from her cast to the prosthesis. Emma’s case is providing a unique and beneficial teaching opportunity for everyone involved. The practice of using prostheses with large equines is relatively uncommon due to size and weight-bearing limitations. Because Emma is a miniature donkey, she will be fairly small as an adult, weighing approximately 350 pounds full grown. This gave Caldwell and Fletcher hope for a positive prognosis and success in Emma’s treatment. Emma is now 13 weeks old and has thrived with her prosthesis, making an impression on everyone who has worked with her. Fletcher, who sees patients in the Opelika, Ala. and Columbus, Ga. Hanger Clinic locations, said that as Emma grows, she could potentially transition through eight or nine variations of the prosthesis before reaching full growth. At that point, she will be fitted with a piece that is more permanent. The prosthesis is made of carbon fiber, Kevlar and fiberglass, materials that are strong and extremely light, and the same materials used for prostheses for Paralympic athletes. The materials are also flexible and adjustable to allow for growth and progression in Emma’s gait. The first finished prosthesis weighed less than a pound; the most recent iteration, which is pink, is smaller, but weighs a little more to provide stability as she’s grown taller and almost doubled her weight since surgery. Caldwell said he has learned a tremendous amount from the case and it has given him hope that in the future amputation and prosthesis could be a more feasible option for larger horse patients. About Auburn University Veterinary Teaching Hospital: The Auburn University Veterinary Teaching Hospital provides state-of-the-art veterinary care and serves as a referral hospital and community practice facility to communities throughout Alabama and neighboring states. With board-certified specialists and a nationally renowned faculty, clients of the teaching hospital benefit from the combined expertise of specialists utilizing a team-based approach to patient health care. Challenging cases that require comprehensive diagnostics, imaging or therapies are sent to the hospital by referring veterinarians and this relationship ensures that animals receive the benefit of the latest clinical trials, research and treatment protocols available. For more information, visit http://www.vetmed.auburn.edu/hospital. About Hanger: Founded in 1861 by James Edward Hanger, the first amputee of the Civil War, Hanger, Inc. (NYSE: HGR), owns and operates 15 patient care clinics in Alabama and 700+ nationwide. Specializing in integrated rehabilitative solutions, the certified clinicians of Hanger provide patients with the latest in orthotic and prosthetic solutions, including microprocessor devices for those with limb loss and neuromuscular technologies for those with paralysis due to stroke, MS and other debilitating conditions. After a six-month celebration of its 150th anniversary, on February 1, 2012 Hanger unveiled a comprehensive new brand identity to position the company for the future. The new brand includes renaming the parent company from Hanger Orthopedic Group, Inc. to “Hanger, Inc.”, and referring to the patient care business as “Hanger Clinic” (formerly Hanger Prosthetics and Orthotics). For more information on Hanger and the new brand, visit www.hanger.com.